Take a look at the photo to the right. If you were told that Cobbler is a collie and Crash is a golden retriever, you'd have no trouble picking them out of the group. Their coats, colors, and features mark them as members of distinct breeds. What's not so obvious is that their differences are more than coat-deep. These dogs may harbor genetic differences that could determine whether a treatment their veterinarian prescribes will help them—or kill them. Katrina Mealey, a veterinary pharmacologist in WSU's College of Veterinary Medicine, has launched a study of how different breeds of dogs react to common medications. Just as a dog's genetic heritage can predispose it to certain health problems—hip dysplasia in German shepherds and cancer in boxers, for example—it can also affect the dog's ability to respond to medications. "Different breeds react differently to different drugs," says Mealey. "If you test a drug in a beagle it's fine"—but in a herding dog the same drug could be lethal. 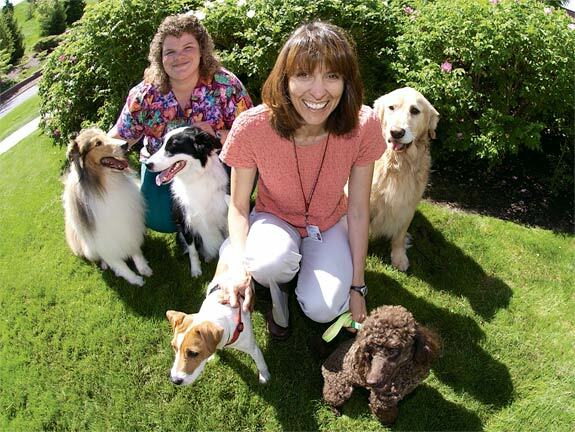 Mealey first ventured into the field of pharmacogenetics a few years ago, when she discovered that dogs of herding breeds have a high risk of carrying a mutation that renders normally harmless drugs deadly. 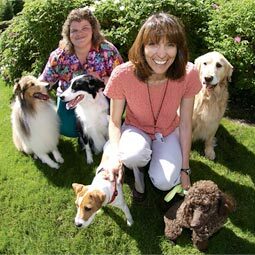 She found that three-quarters of collies and up to 10 percent of other herding breeds, such as Shetland sheepdogs and Australian shepherds, carry a mutation that disables a protein that pumps drugs out of cells. With the mutant form of the protein, drugs accumulate inside cells and eventually reach toxic levels. The problem first showed up as a bad reaction to ivermectin, a leading heartworm preventative, but it involves a wide range of other drugs and chemicals. Abamectin, an ingredient in lawn-care sprays, is labeled as being safe for pets. Mealey showed that's not true. It's safe for dogs with the normal form of the pump protein. For dogs with the mutant form, it's a killer. Even common over-the-counter drugs can be deadly. In clinical tests, normal collies that were given the standard dose of the anti-diarrhea medication Imodium® did fine. Collies with the mutation, however, began to stagger and become comatose. All the dogs in Mealey's study recovered after being given an antidote, and were later adopted by area residents. Unfortunately, she says, many dogs nationwide were not so lucky. "Dogs were euthanized for horrible neurological problems, when all they had was this adverse reaction to the drug," she says. Her work led to a simple test for the mutation: owners run a swab along the inside of their dogs' cheeks and send it to Mealey's lab for analysis. The test has become standard procedure for collie breeders. Mealey is now looking for mutant forms of an enzyme that, in humans, is involved in metabolizing about half of all medications used. She hopes to get DNA samples from at least 25 unrelated dogs of every one of the 150-plus breeds recognized by the American Kennel Club and United Kennel Club. Donor dogs need not be registered with those organizations, but they must have an AKC or UKC "puppy number" the researchers can use to confirm their ancestry five generations back. "We're not snobby," says Mealey. "We just need to know that they're purebred and they're not related to another dog in the study. We don't want to find a family problem instead of a breed problem." The breed-specific aspect of her work has drawn the attention of the Food and Drug Administration and National Institutes of Health. Both agencies sponsor research exploring the links between genes and drugs in humans. Mealey says her collie work got a huge response from doctors when she presented it medical conferences because of the strong breed correlation and the high percentage of dogs affected. "So far there's been nothing like it in humans," she says. "Those numbers are unheard of in pharmacogenetics, for people." Medical researchers have developed a few tests for humans like the one Mealey developed for dogs, and the push is on for more detailed information about how individual patients respond to various drugs. About 100,000 Americans die each year as a result of adverse reactions to medications, and another two million suffer serious side effects, largely due to a mismatch between drug and patient. A few of the key proteins involved in drug responses have been identified. For instance, humans have a pump protein similar to the collie protein. A person with a mutant form of that protein or the drug-metabolizing enzyme would have problems handling many different medications. Since differences in our bodies' ability to respond to drugs derive from our genetic makeup, they are also related to our racial or ethnic heritage. Identifying which drugs will work best and which will cause problems for specific groups of people will eventually improve patient care. However, it also goes against our inclination to ignore racial and ethnic differences. The issue came to a head a couple of years ago, when doctors prescribing their black patients and white patients different heart medications faced charges of racism. It's an emotionally charged issue in which historical inequities sometimes make it difficult to even ask the relevant medical questions. "It's easier for us to go for breed-related differences," says Mealey. "The FDA is very interested in it, because it's easier to talk about breed differences than race differences. I think that maybe they can come to it this way. It makes sense." For more information, visit Mealey's Web page. Just click here.